This great space rock, iron meteorite jewelry set was made using the Campo del Cielo meteorite. It arrived from our universe to earth in ancient times. We selected the best meteorites to make this very distinctive and elegantly hand wire wrapped meteorite jewelry pendant necklace earrings set, in sterling silver with an adjustable sterling silver 16-18" chain. The meteorites in this pendant necklace jewelry earrings set are all similar, yet different. They are the best quality Campo del Cielo meteorites available and are professionally polished and hand wire wrapped. They are great for casual, holiday or evening wear. The Campo del Cielo iron meteorite was discovered by explorers, in Argentina. The aboriginal inhabitants of the area had known about them since ancient times. The meteorite name is a Spanish translation of Campo del Cielo, meaning "Field of the Sky," derived from local legends that the heavens rained rocks from the cosmos. Looking for the right gift for someone who has everything or you just don't know what to get them? 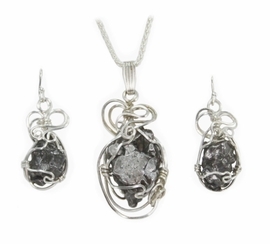 They should love this gorgeous meteorite jewelry set that is distinctive and professionally hand wire wrapped in the USA! This elegant and beautiful meteorite space rock jewelry set is shipped in a quality jewelry box with information about the meteorite and a Certificate of Authenticity. Also available in 14K gold, upon request!